With the departure of Odell Beckham Jr. comes a massive void in the red zone that the New York Giants must address this offseason. The acquisition of Golden Tate helps in moving the ball down the field, but he’s not known for his ability to catch touchdown passes. The only true targets in the end zone are Cody Latimer, Bennie Fowler, and tight end Evan Engram. None of the options listed above are trustworthy on a consistent basis. The Giants could look to the draft to find a big-bodied wideout with the ability to outmuscle corners and snag balls at its highest point. 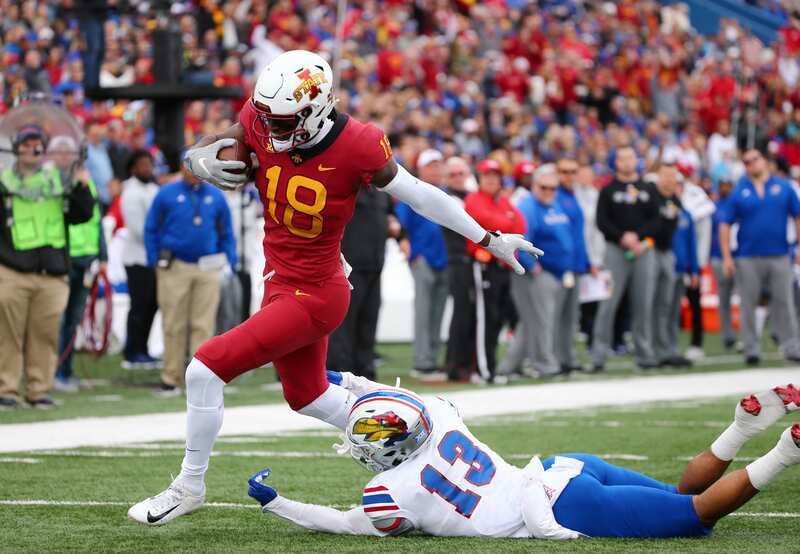 A day two gem in the 2019 NFL draft could be Iowa State receiver Hakeem Butler. Standing at 6’6″, 225 pounds, Butler is a true “go get it” pass catcher. With 4.48 speed and immense physical tools, the Giants would be wise to consider him as a fresh option on the outside, especially if they elect to take a quarterback with the No. 6 overall pick. Butler is a fantastic long-ball receiver, with massive strides and length to contest balls against corners and safeties. Additionally, he has the size to plow through tackles and reach the endzone. His downside, unfortunately, is his route running. Butler is a below-average route runner with lackluster agility. He has straightaway speed and great size, but expecting him to make sharp cuts and change direction on a dime is overzealous. The Iowa State star reminds me of Calvin Johnson – yes, a very optimistic comparison, but one that’s relevant to his size. Johnson also wasn’t the most pristine route runner and was utilized in the deep-game frequently. Last season, Butler racked up 1,318 yards and nine touchdowns. He averaged an astounding 22 yards per reception, which attests directly to his skill-set. For the Giants, they would be gaining a deep threat that can refine his abilities alongside Tate and Eli Manning for one season before establishing himself as a potential top option for a young quarterback. That would be the dream scenario, and he will likely be available at No. 37 for the Giants if they wish to allocate a draft selection towards the WR core.